Join Dorothy and friends for breakfast at The Petroleum Club! Enjoy delicious breakfast faire and visit with our ballerinas in their Wizard of Oz costumes. Snap a picture with your favorite Wizard of Oz characters and get their autographs on a commemorative 2019 Wizard of Oz mini poster. Tickets are $30.00 for adults and $20.00 for children 12 and under. To make a reservation, call The Petroleum Club at 318.425.4251. Join us for an exciting evening of gaming to support the mission and projects of Shreveport Metropolitan Ballet! Only 150 tickets will be sold. Every ticket will be drawn and every ticket is a winner. The last ticket drawn wins $1,000 cash! Cash prizes to every 10th ticket drawn. Pick-your-prize winners throughout the event with more than 100 prizes from local businesses. 50/50 and second chance drawings. Tickets are $75.00 each and include dinner and event entry for two and one raffle entry. Dinner includes non-alcoholic beverages. Cash bar available. No tickets will be available at the door. Any unsold raffle entries will be available to pre-sold ticket holders the night of the event for $25.00 each. Must be 21 years old to purchase a ticket. Must be 21 years old to attend the event. Call the SMB office at 318.221.8500 to purchase tickets. Kick off your Nutcracker weekend with Breakfast with the Ballet at The Petroleum Club. Enjoy delicious breakfast faire and visit with our ballerinas in their beautiful Nutcracker costumes. Snap a picture with your favorite Nutcracker characters and get their autographs on a commemorative 2018 Nutcracker mini poster. Make your Nutcracker experience even more magical with an exclusive VIP experience! Before taking your seat for the show, join us at 5:00 pm at The Strand for our VIP Pre-Show Party. Adult ticket price includes one cocktail and hors d'oeuvres. Cash bar available. Under 21 ticket includes non-alcoholic beverages and hors d'oeuvres. Join us after the show (approximately 5:45pm) for a VIP meet & greet with dancers in full costume! Snap a picture and get an autograph while you enjoy our Land of Sweets dessert buffet. Ticket price includes Land of Sweets treats, non-alcoholic beverages, and a keepsake mini-poster for autographs. Join us for a casual evening out as we celebrate SMB’s 45th season! Enjoy heavy hor d’oeuvres, a selection of wines, and the local artisan marketplace at The Agora Borealis. We’ll also feature a selection of works from local artists displayed as part of our silent auction. Tickets are $45. Guests must be 21 years old or older. Tickets WILL NOT be sold at the door. Please make your reservations by Nov. 1, 2018. 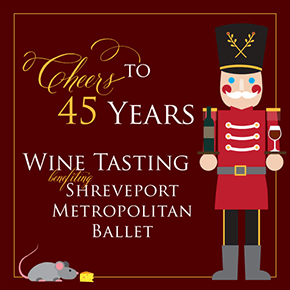 100% of the proceeds from ticket sales go to support the mission and projects of The Shreveport Metropolitan Ballet. Join the Humane Society of Northwest Louisiana and Shreveport Metropolitan Ballet as we reveal the photos for each month of our soon-to-be released "Pups & Pirouettes" calendar! The "Pups & Pirouettes" calendar will feature beautiful SMB dancers with adorable pups from the Humane Society photographed in iconic Shreveport-Bossier locations. Proceeds from calendar sales will benefit the Humane Society of Northwest Louisiana and Shreveport Metropolitan Ballet. Calendar pre-orders will be available during the launch party! Copyright © 2019 Shreveport Metropolitan Ballet. Access the Cast Portal.